Robert Grimmett grew up in a military family and graduated from Radford High School in Honolulu. He is currently pursuing a B.S. in Mechanical Engineering at the University of Hawai‘i at M?noa. 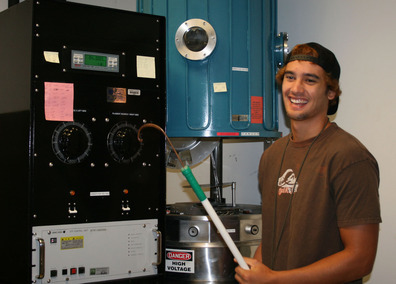 Robert is a member of the Native Hawaiian Science and Engineering Mentorship Program, Kahue Wai Ola STEM scholars, and the Renewable Energy for Island Sustainability program. In his free time he likes to surf, hike, and camp. Most high-performance telescope mirrors are created by coating a glass substrate with a reflective substance using the process of physical vapor deposition: aluminum (or other metallic substance) is vaporized from a high-current filament inside an evacuated chamber, and aluminum atoms deposit into a solid coating on all objects within the chamber. The Institute for Astronomy (IfA) on Maui is currently capable of aluminizing 30-cm-diameter mirrors with a peak-to-valley variation of 100 nm. This project seeks to improve mirror-coating techniques in three areas: smoothness, durability, and reflectivity. Smooth mirrors are needed to reduce scattered light within the telescope’s optical path, and the best way to make a smooth mirror is to start with a clean, smooth substrate. We found that an ultrasonic bath and nitrogen air gun are best for removing debris during substrate preparation. A durable coating is necessary for mirrors to withstand long-term exposure and use. To create a durable, long-lasting coating, good adherence of the aluminum to the glass substrate must occur. Our study showed that the cleaning technique used during substrate preparation is key for durability, as well. Finally, reflectivity is most important because it is the essential function that makes a mirror, a mirror. Aluminum coatings reflect a greater range of visible wavelengths at a higher reflectivity than other metals. The IfA is now able to implement these improved techniques when coating mirrors using their existing vapor-deposition equipment.